Here is a better picture of Paddock's tatoo of the number 13 on his neck. Plain as day! The maintenance folks at the Mandalay Bay indicated the windows can be removed by maintenance, for maintenance. Was designed this way! Part of the false flag is the fact that they broke those other 2 windows for the reason of deniability concerning the 4th floor! Jesus Campos had originally been praised for his apparent heroics on October 1st, as he supposedly rushed to Paddock’s suite, was shot in the upper thigh through the door, and continued to help get people to safety despite his wounds. 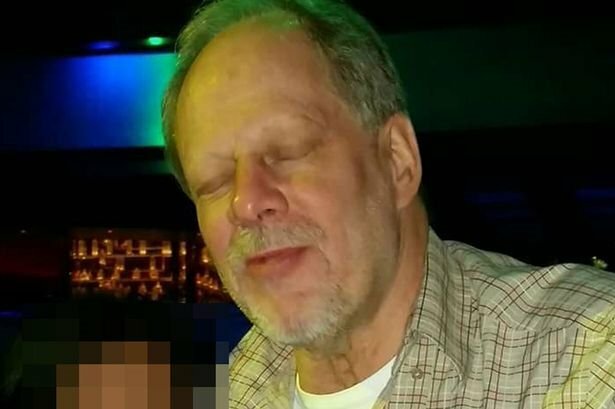 However, FBI officials involved in the investigation now believe he was an accomplice of Paddock’s, and was involved in the initial shooting as a second gunman from the other broken window in Paddock’s 32nd-floor room. According to a senior FBI official, authorities became suspicions by the extreme amount of gunpowder residue found on Campos’ hands and inconsistencies in his timeline of events. “We believe he killed Paddock, shot holes through the door and his own arm to produce physical evidence for his cover story, then went and lay next to the elevator,” the FBI official told CNN. An anonymous source working on the investigation told CNN that authorities are now in possession of security footage showing Campos smuggling the firearms used in the massacre in through a Mandalay Bay loading dock in the days leading up to the event. It’s been almost two weeks since the Las Vegas massacre took the lives of 58 concert-goers, and there seems to be more unanswered questions at this point than ever before. The mainstream media as well as the Las Vegas police department have been caught in multiple lies leading many of us to believe that we have been fed a giant pile of BS up until this point. Now the sole witness who could have proven the truth about Las Vegas has mysteriously just been found dead, as a massive scandal rips across social media today. With authorities and possibly top-level government agents now participating in an active cover-up, just how frantic and determined are these liars going to be at stopping the truth from coming out? Would they actually KILL Americans in order to BURY the truth about Las Vegas? According to breaking reports, it sure appears to look that way. Up until Kymberley Suchomel was found mysteriously dead in her home on Wednesday in the early morning hours, the 26-year-old was very vocal in her assertion that there were multiple gunmen involved in the shooting. She had spoken to multiple news agencies about the truth of what happened that night and was determined to not let the trail of evidence run cold. "On October 10, 2017, Shepard Ambellas, Publisher of Intellihub.com transcribed the audio from publicly available Las Vegas Metro Police scanners to form a timeline of the massacre of October 1st. This timeline and the multiple incidents and locations of shooters support statements made by the young Gio Rios, who was near the front row at Jason Aldean’s performance and narrowly escaped getting shot. Rios recorded his account of the events in the Facebook Livestream above on October 8th. Rios’ testimony is summarized beneath the police scanner timeline. Rios reports hearing additional rounds of gunfire being shot from both outside and within the Tropicana hotel, as well as from the direction of the New York New York hotel. These events are also referenced in the police scanner timeline below and are in serious contradiction to the official “Lone Nut” narrative about Stephen Paddock being presented by the Las Vegas police department and the Mainstream Media. When the TV was turned on and it was announced that, “Two were confirmed dead and 20 injured,” Gio and Marissa were shocked because they had seen with their own eyes that the casualties were much greater. The local TV station flashed the phone number for the FBI tip line. Gio immediately called the FBI and relayed everything that’s been stated here. At that point, he thought this was the right thing to do. He’s not so sure about his safety anymore (!)"